Some times the simplest of ideas are to use up what you have in your own home. 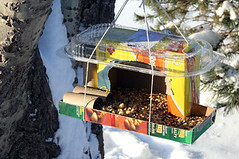 After completing our pine cone feeders we had a lot of extra suet/cornmeal/birdseed food left over. 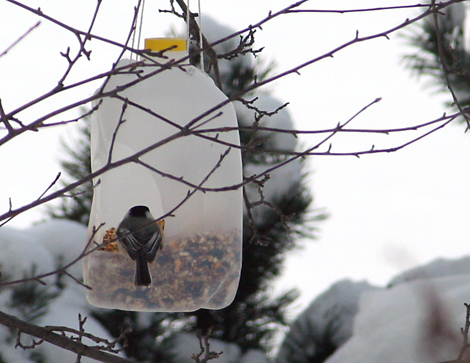 At first we thought we'd just freeze the rest but realized that if we could come up with a bird house design, or two, the birds wouldn't mind the extra food or place to perch. 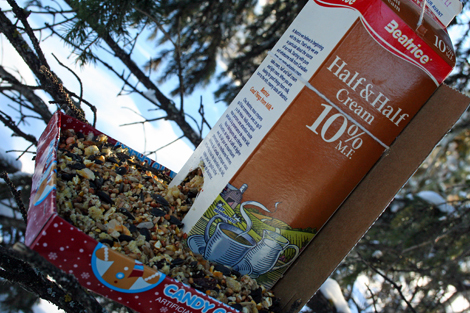 The first place we looked was the recycling bin for odd shaped cartons, boxes, & jugs; really anything sturdy enough to hang from a branch, as well as hold the feed. Other supplies we used were an exacto knife for cutting (with adult supervision or by an adult, please) tape and string then you are pretty much set. Your youngster can decide on the design: windows, doors, etc. and you can help with your almost expert architectural skills; don't want the house collapsing on the wee birds now. 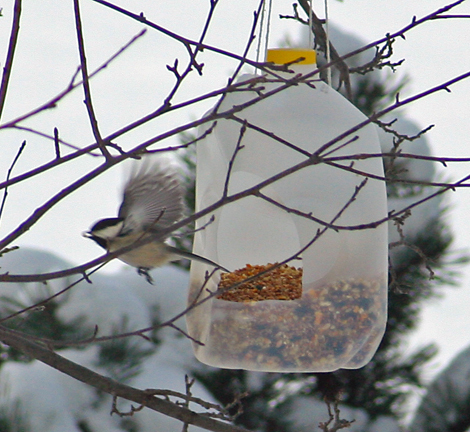 From 1 L cream containers to the big 4 L milk jug, the feeders are attracting the birds at regular intervals. 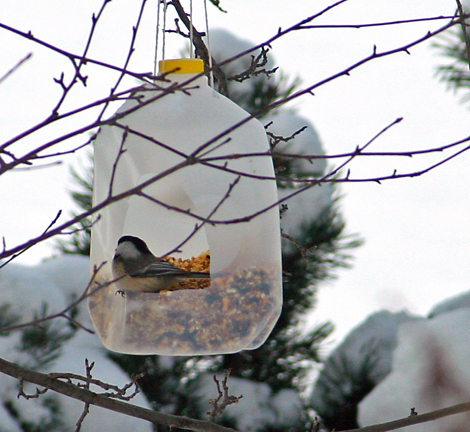 So far we've been able to catch the black-capped chickadee making a stop, but even he doesn't stay still for very long before he is off again. They do this all day. 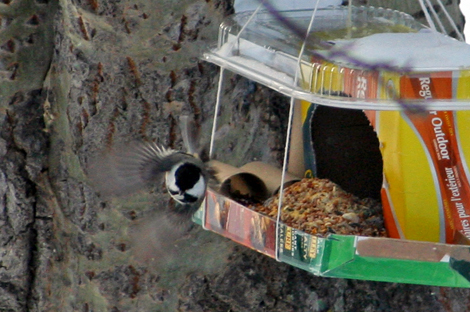 Fly into the feeder for a quick grab of food and fly out. 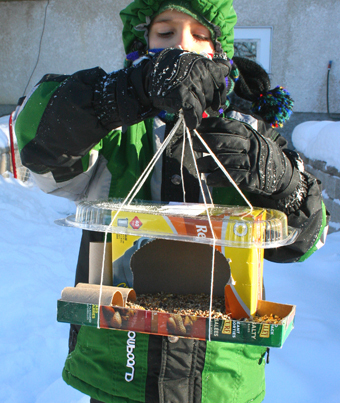 Our funnest (& most creative) feeder by far consists of a garbage bag box, granola bar box, toilet paper rolls and a clear plastic lid to keep the snow from disintegrating the design. The B-meister was really into the construction of this one. He is so proud of his bird feeder house. Keep in mind that these won't last forever, but they do provide a good winter activity if you are housebound with the bonus that they didn't cost anything just some time and imagination.